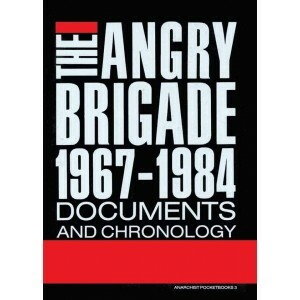 Angry Brigade, Documents and Chronology Shows some extent of the armed struggle that was carried out in Britain in the late sixties and early seventies, reproposing the validity of armed attack against capital in all its forms. The eight libertarian militants on trial in the Old Bailey in 1972 who were chosen by the British State to be the `conspirators' of the Angry Brigade, found themselves facing not only the class enemy with all its instruments of repression, but also the obtusity and incomprehension -- when not condemnation -- of the organised left. 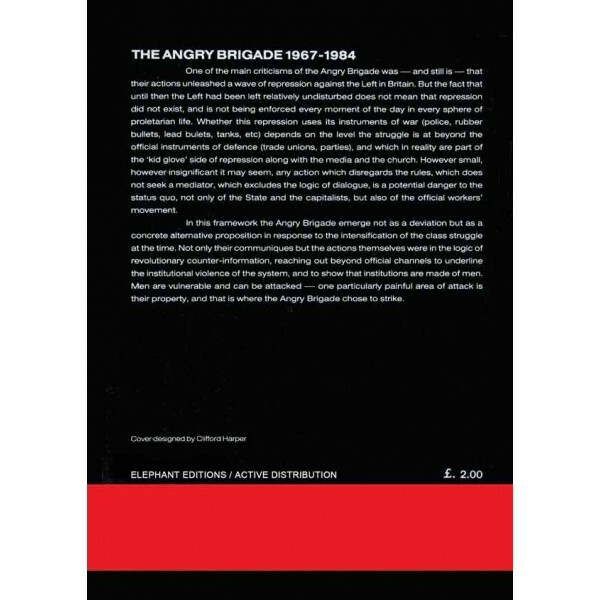 The problems encountered by the comrades of the Angry Brigade were similar to those of other groups active at the time who had refused the limits of struggle delineated by the State -- the so-called limits of legality, beyond which the repressive mechanism is is unleashed -- and taken as their points of reference the level of mass struggle. This decision was in defiance of the State's definition of the struggle's confines. It also defied the limits imposed by the official workers' movement and the extraparliamentary organisations, including the anarchist movement. The Symbionese Liberation Army in the US, the RAF in Germany, the first of the Red Brigades in Italy, were all isolated by the `revolutionary' organisations, condemned as agitators, provocateurs, individualist terrorists threatening the growth of the mass movement. On the attitude to the SLA, Martin Sostre was to write in America: "The denunciation of the SLA by the movement press is indistinguishable from that of the ruling class. Each left organisation seems to be competing with the others for their legitimacy by denouncing the SLA...Conspicuously absent from the denunciations is any discussion of the role of armed struggle. Revolutionary violence is seen as something repulsive that should be shunned. The left movement press would have one believe that to overthrow the criminal ruling class we have merely to organise mass movements, demonstrations of protest and repeat revolutionary slogans." One such paper in this country -- the Trotskyist Red Mole -- distinguished itself by calling for solidarity with the comrades accused in the Angry Brigade trial. With the following reservation -- "It is no use the organised left criticising the politics of the Angry Brigade, unless we also recognise why a lot of potentially very good comrades reject the various leninist organisations, and indeed resort to bomb-throwing -- until you are caught -- by itself an easy option that does not deal with the problem of helping to change the political understanding of millions of people." Understandable enough in view of the Leninist programme. But from the anarchist perspective? We read on the front page of a fairly recent issue of Freedom, "Even the bombing campaign carried out by the Angry Brigade which was technically brilliant...achieved absolutely nothing because, in direct contradiction with their spoken ideals, they were trying to act as an elite vanguard leaving ordinary people as passive spectators of their actions. Far from this resulting in an `awakening' of the masses' it resulted in a fear of anarchism and anarchist ideas which has significantly contributed to our current impotence." In fact the movement of the exploited is not and never has been one monolithic mass, all acting together with the same level of awareness. The struggle against capital has from the beginning been characterised by a dichotomy between the official workers' movement on the one hand, with its various organisations -- parties, unions, etc, channelling dissent into a manageable form of quantitive mediation with the bosses. And on the other hand, the often less visible movement of `uncontrollables' who emerge from time to time in explicit organisational forms, but who often remain anonymous, responding at individual level by sabotage, expropriation, attacks on property, etc, in the irrecuperable logic of insurrection. There is no distinct or fixed dividing line between the two movements. They often affect each other, the surge from the base obliging the big official organisations to take a certain direction, or the inverse, where the latter put a brake on autonomous struggles. Many of those who make up the mass of union membership, are also extremely active in extra-union (and by definition extra-legal) forms of struggle. Each side, however, has its own heritage: on the one a heritage of deals and sell-outs, the great victories that are real defeats on the workers' backs; on the other, a heritage of direct action, riots, organised insurrections or individual actions which all together form part of the future society we all desire, and without which it would be nothing but a utopian dream. A brief look at the development of the struggle in this country shows this duality quite clearly. The organised anti-capitalist movement as we know it today began to take shape at the beginning of the nineteenth century. Unlike the other European capitalist countries developing at the same time, there was only a minor communist influence both at organisational and ideological level. Traditional British anti-intellectualism and `common sense' were perhaps fundamental to a more pragmatic form of organisation which took the form of trades unions. These unions were from the start reformist, although at times, through pressure from the base, some knew insurrectional moments. The changes the unions proposed were however usually intended to come about using non- violent methods within the constitutional limits. During and immediately preceding this period there also existed forms of autonomous revolt, such as that of the many artisans in the textile industry who, under threat of losing their jobs or of being reduced to non-specialised labourers, organised in armed groups. The most significant of these insurrectional movements was that known as Luddism, which took place between 1810-1820. During this period an immense amount of property was destroyed, including vast numbers of textile frames redesigned to produce inferior, shoddy goods. The Luddites, taking the name of Ned Ludd who had taken a sledge hammer to the frames at hand, organised themselves locally and even federally with great coordination, and in spite of vast deployments of soldiers especially in West Riding and Yorkshire where the movement was strongest, generalised insurrection was approached on more than one occasion. As John Zerzan points out, this was not the despairing outburst of workers having no other outlet, as a long tradition of unionism was in existence among textile workers and others prior to and during the Luddite uprisings. In the early 1830's it was the turn of agricultural workers become casual labourers to organise in the `army' of Captain Swing, a mythical figure adopted as a symbol of the farmworkers who burned ricks and barns, threatening their oppressors -- farmers, vicars, justices of the peace alike -- with the same fate. Where the Luddites were extremely organised, the Swing men lacked secrecy. Nineteen of them were hanged (sixteen for arson), 644 jailed, and 481 deported to Australia. While the unions were working to develop industry along with the bosses, the base were developing different, uncontrollable forms of struggle such as go- slows, wildcat strikes, sit-ins, etc. For example, of the 421 strikes in the docks at the beginning of the sixties, 410 were unofficial. These same workers had already experienced troops being moved into the docks by a Labour government, and TGWU officials giving evidence against their own members ten years before. The politics of everyday life -- organising around one's own oppression, trying to overcome the division between workers and students, between men and women, forming groups around precise problems as opposed to under political banners -- was in full development. A vast movement of claimants, squatters, feminists, etc, emerged expressing not the Right to Work but the Refusal of Work, not employing the waiting tactics of unionist education but taking, Here and Now, what was being refused, and refusing what was being offered. A critique of the nuclear family as a firm bastion of capitalist power led to many experiences of communal living. This movement in all its complexity, not so much a students movement, but a widespread one comprising of young workers, students and unemployed, could be called the libertarian movement of the time. This movement was comprised of autonomous groups acting outside the stagnant atmosphere of the traditional anarchist movement with its own microscopic power centres which, as Bakunin so astutely pointed out, are just as nefarious as any other power structure. A parallel can therefore be drawn between the dichotomy within the workers movement, and that which exists within the anarchist movement. On the one hand there are the comrades who hold positions of power, not carrying out any precise activity to contribute to the revolutionary consciousness of the mass, but who spend their time presiding over meetings and conferences aimed at influencing younger comrades through the incantation of abstract principles. These principles are upheld as the only true tenets of anarchism, and are adhered to by those who, either by laziness or weakness, accept them acritically. The manifestations of these islands of power usually take the form of publications that are long standing and repetitive. They have the external semblance of an `open forum' for the use of the movement as a whole, but the basic ideology -- that of conservation and stasis -- is filtered through from behind the flurry of `helpers' carrying out the task of `filling' and physically producing the publication. These publications are the first to condemn autonomous actions that take their points of reference from the illegal movement of the exploited. They are the first to denounce them, accusing them of bringing police repression down on the anarchist movement. In their reveries they have forgotten that repression always exists, and that only in its most sophisticated form creates the peaceful graveyard of acquiescence, where only ghosts are allowed to tread. Many of the most forceful of recent social rebellions have been fired and spread by the popular response to police repression. By their actions the Angry Brigade also became a part of that spectacle, but a part that took form in order to contribute to its destruction. Their actions as presented here find a place therefore not as some old commodity to be taken out and dusted, then put back on the shelf like a relic that belongs to the past. The work they carried out -- and which five libertarians paid for in heavy prison sentences -- is a contribution to the ongoing struggle which is changing form as the strategies of capital change in order for it to restructure and preserve itself. A critical evaluation of the Angry Brigade must therefore take place elsewhere than on the sterile pages of this pamphlet. It must take place in the active considerations of a movement that has a task to fulfil, and that does not take heed of the condemnation and defamation by those whose ultimate aim is to protect themselves. 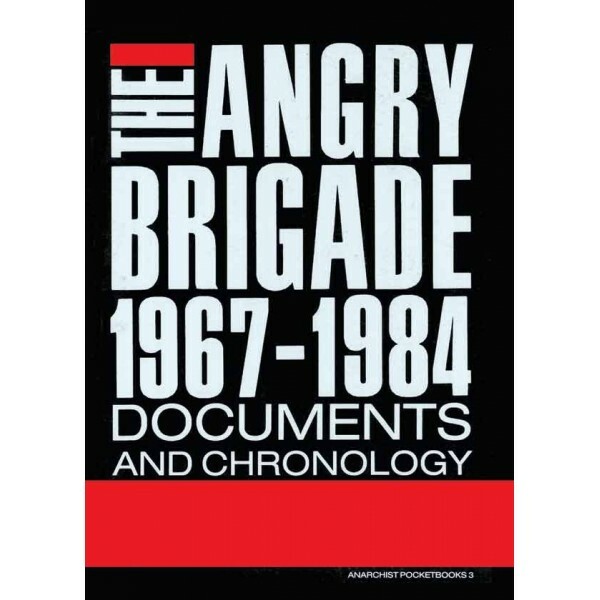 Many problems are raised by a rereading of the actions and experiences of the Angry Brigade -- clandestinity or not, symbolic action or direct attack, anonymous actions or the use of communiques to be transmitted by the media -- to name but a few. The pages that follow help to highlight these questions, whose solution will only be found in the concrete field of the struggle.